I’m looking forward to visiting a new exhibition in the Scottish Parliament, Edinburgh, that explores the turbulent times in which William Wallace lived. The exhibition, ‘Special Delivery: The William Wallace Letters,’ features the only two surviving letters connected to Wallace. 1) The ‘so-called’ Lübeck Letter, which invited the ports of Lübeck and Hamburg to resume trade with Scotland. The letter was issued by Wallace and Andrew Moray as Guardians of Scotland after their success at the Battle of Stirling Bridge in 1297. 2) A letter dating to 1300, sent by French King Philip IV to his agents at the Papal Court asking them to assist Wallace in his business before the Pope. 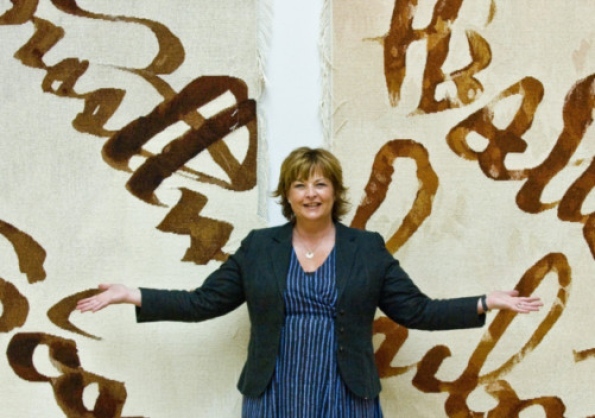 Culture Secretary Fiona Hyslop unveils the tapestries. Since both documents are very fragile and will only be displayed under controlled lighting for a limited period, this is a once-in-a-lifetime opportunity to view an important part of Scotland’s history, and to discover the story behind the real William Wallace. A pair of tapestries inspired by the intricate lettering and parchment of the documents will be on display at the exhibition. Commissioned by National Records of Scotland, and designed at Dovecot Studios in Edinburgh, the tapestries will hang behind each of the exhibits. The exhibition will run from from Friday 10 August to Saturday 8 September 2012, (closed on Sundays and on Monday 13 – Tuesday 14 August). Opening hours: 10:00am to 5:00pm (except 9:00am to 6:30pm on 4-6 September). Entry is free. Find out more about ‘Special Delivery: The William Wallace Letters,’ at the Scottish Parliament website here and here. You can read a very interesting article about one of the Wallace letters in the online Herald Scotland newspaper here. Or watch a related video below. Today, I found myself in the privileged position of touching, and leafing through, eight medieval manuscripts, part of the Special Collection of the University of Glasgow Library. 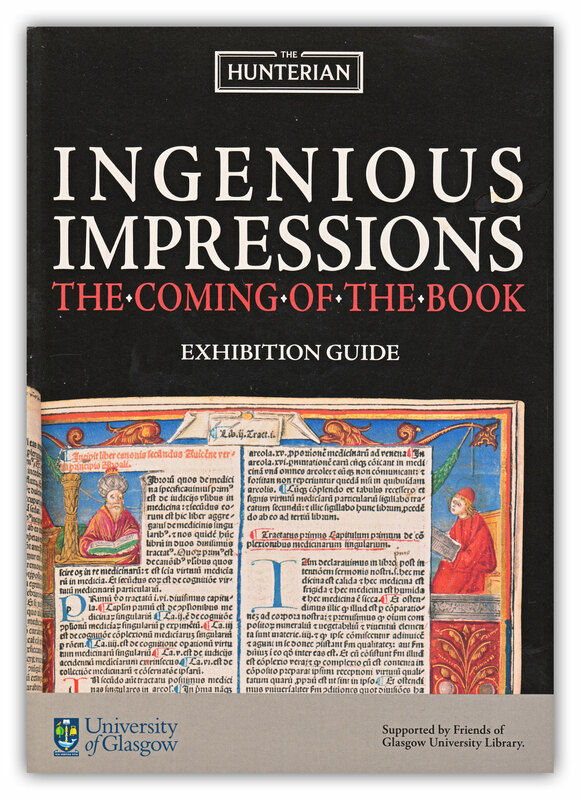 It felt strange, turning the pages of these wonderful ancient manuscripts as easily as I would turn the pages of a modern paperback… particularly when the manuscripts date as far back as the 10th century. I knew that we were going to be shown some manuscripts, but I expected them to be inside glass cases, to be viewed from a safe distance. Imagine my surprise when we filed into a room to discover the eight manuscripts laid out on tables, and totally accessible. We took a seat and were treated to a fascinating account of each manuscript’s history by Mrs Julie Gardham, Senior Assistant Librarian, who made us all feel very welcome. Then, with one slight provision from Julie that we made sure our hands were clean (we checked – they were), she informed us that we could come forward and have a closer look at the manuscripts. She had even bookmarked pages of particular interest in each manuscript (although every single page I looked at was, in my mind, worthy of bookmarking!). And so, along with Annie, Betty, Morag, Edith, & Veronica, five students from one of my recent calligraphy classes, I was able to study, at close hand, these amazing works of art, one of which is 1000 years old. It was a once-in-a-lifetime experience, and I am grateful to Annie for organising the visit, and to Julie for enlightening us on the history of each manuscript. The photograph above shows two pages from “On the Consolation of Philosophy” by Boethius, my particular favourite of the manuscripts that we viewed. My second favourite was a pocket-sized French bible (pictured left), dating back to the 13th century, which contained the tiniest calligraphic lettering I have ever seen. Standing only a few feet from the Bible, the pages looked like they were scored with a succession of irregular black lines. Only on closer inspection, did it become clear that the black lines were in fact rows of calligraphic text, the diminutive size of which had to be seen to be believed. Fortunately, a magnifying glass had been laid beside the bible for our convenience. On squinting through the magnifying glass I saw that, despite the letters being only a few millimetres tall, they featured incredible detail, and were complete with fine hairlines… a remarkable achievement considering that much of the lettering was probably produced by scribes working by candlelight. I must have said, “that’s unbelievable,” about thirty times in five minutes. Monastic manuscript (St Paul’s, Utrecht) with 15th century additions. Proto-Gothic script with interlace and inhabited initials. 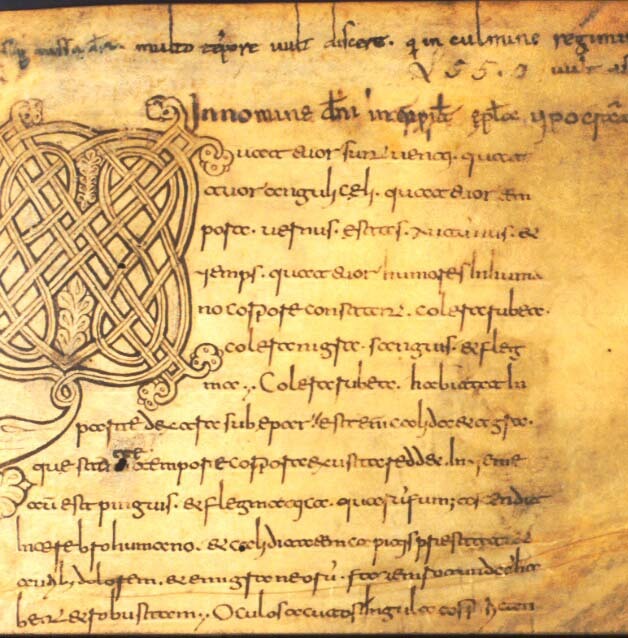 Written in the characteristic Beneventan script of South Italy. With a number of penwork initials ornamented with heads, birds and fish. The drawings are heightened with the same red ink as is used in the headings, and were probably the work of the scribe. Written at the monastery of Durham by a number of scribes during the second quarter of the twelfth century, this manuscript is a compilation of several works. It is closely related to, and in part probably copied from, another manuscript still at Durham (Hunter 100). Pocket sized, meant for private use. Closely written in a gothic script on fine vellum. The decoration and historiated initials were probably added at a later date from the script (possibly in Germany). Written in an exquisite northern Italian hand, and signed in two places by the scribe Brother Amadeus, who possibly worked for Giangaleazzo Visconti. 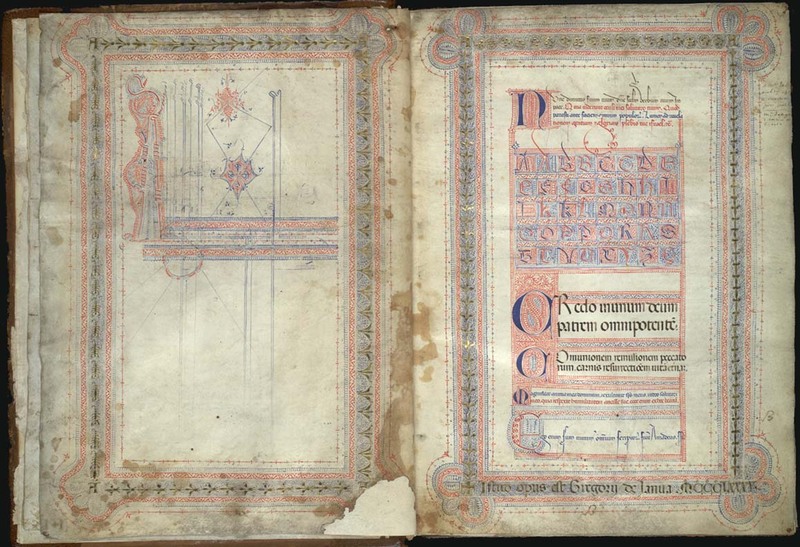 Each of the five books is introduced by a beautifully floreated and gilt initial. Compilation of texts written in a beautiful humanistic book hand in about 1463; the decoration was added in the 1480s. Made by Geoffrey and Thomas Spirleng and completed in January 1476. 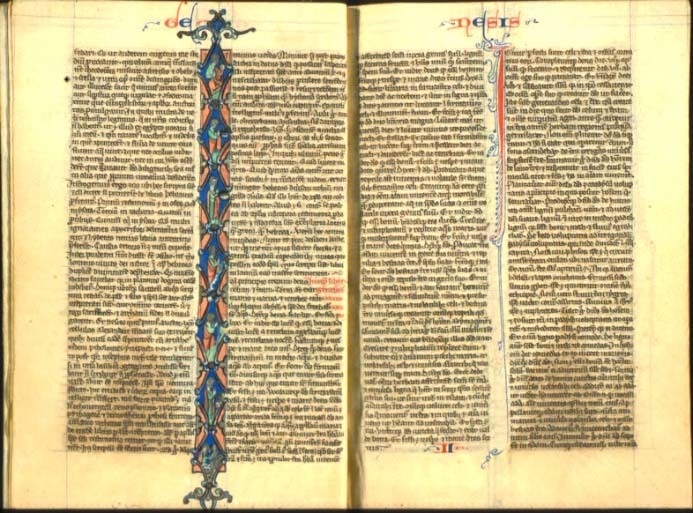 Written on paper in an ordinary business hand, the manuscript is generously sized but the layout of the text is economical with no attempt at expensive decoration. Somewhat eccentrically ordered: two tales were missed out and had to be added in at the end, while two tales were inadvertently copied out twice. Printed manual on the “arte of limming” (1573) bound with various manuscript designs for different alphabets, dating from 15th and 16th centuries. 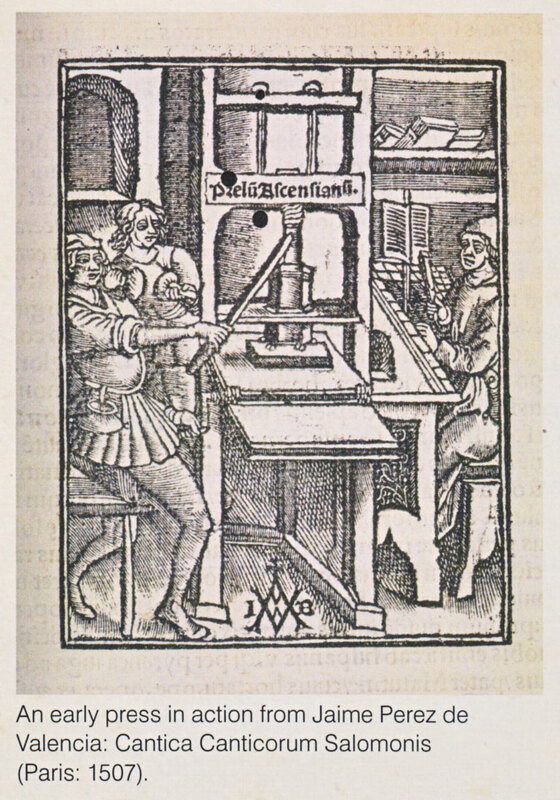 Find out more about the University of Glasgow Library’s Special Collections here.